SXSW 2011: The Head And The Heart, Live In Concert The Seattle-based band performed a lively afternoon set at Mellow Johnny's Bike Shop, live on KEXP. Listen to the seven-song set here. The Head and The Heart performed live on KEXP from Mellow Johnny's Bike Shop in downtown Austin for SXSW. 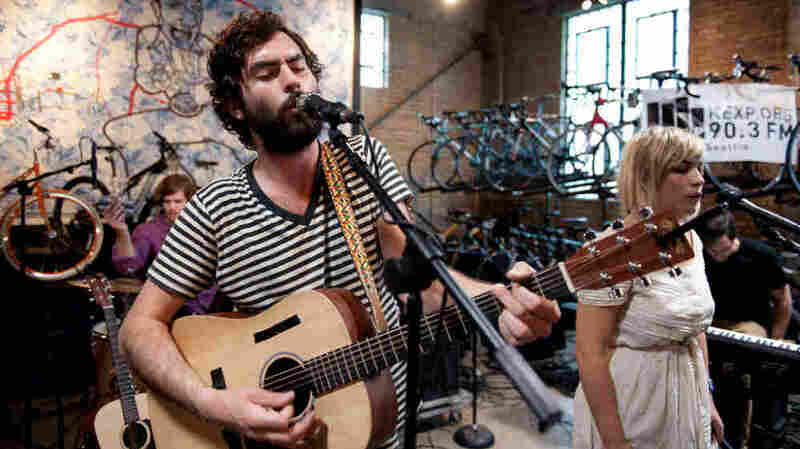 During a set full of songs ruminating on leaving home behind and striving to find it again, Seattle-based band The Head and The Heart was pleased to find familiar faces in the crowd at KEXP's showcase at Mellow Johnny's Bike Shop in Austin. Playing cuts from its self-titled debut, The Head and the Heart displayed its knack for taking tried-and-true folk formulas and giving them a modern kick. Though songs like "Lost In My Mind" and "Winter Song" begin with a lone voice and the soft strums of an acoustic guitar, simple melodies and arrangements blossom mid-way, pushed along by driving pianos, stomps and claps. The band even adds its own twist to tight CSNY harmonies, utilizing the powerful voice of violinist Charity Thielen. Among the recent crop of young groups finding their sound in harmony-heavy Americana, The Head And the Heart has been making a bit more noise than the rest.